Crafts with common household goods are my fave. (I wrote a big ol’ book about it, after all!) And if they are free goods, even better! 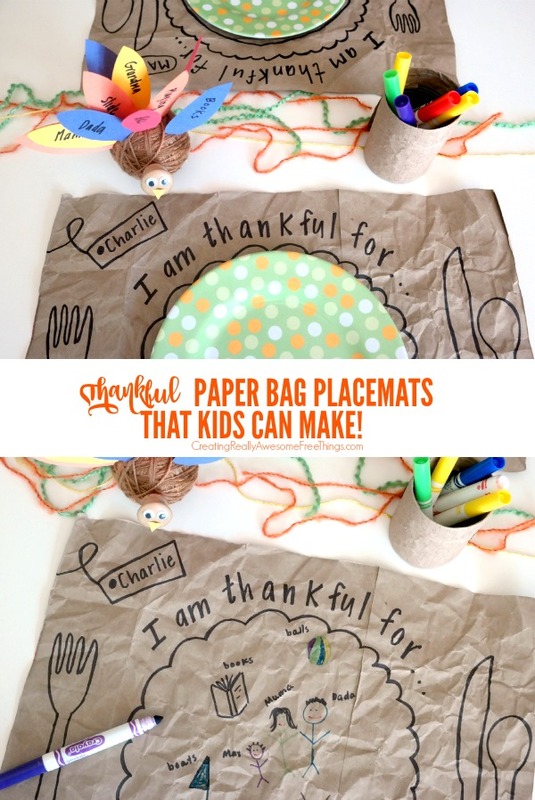 These brown paper bag placemats are adorable and can absolutely be made by the kids! I first made a version of these placemats for a segment on The Meredith Viera Show last December! (You can see the clip here!) But, they are so fun for any dinner, especially a Thanksgiving diner where you can utilize the brown bag as a canvas to doodle on before you dine! These make great Thanksgiving crafts for kids! 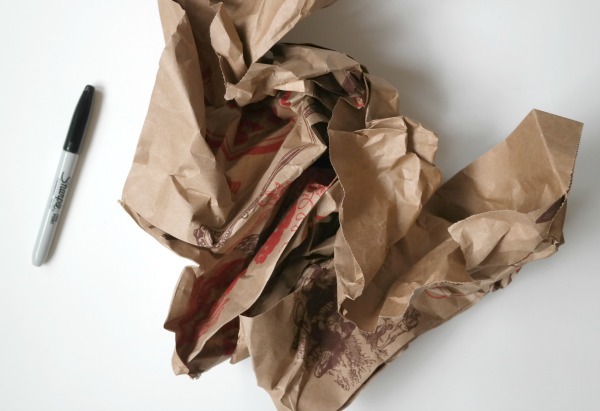 A typical brown paper bag will make 2 placements. Just cut the brown bag open, so that it lays flat. Then cut 2 same size rectangles out of the bag. Voila! Place mats. Well, almost! Now, crumple up the placemat. And crumple it some more! Now it’s time to decorate the placements! Use a dinner plate as a stencil to trace a large circle onto your placemat. Then go back over the circle with a Sharpie marker. Once you have the plate marked, you can use your knife, fork, and spoon as stencils too! Then add, “I am thankful for…” at the top of your placemat and if you’d like them to double as name cards add doodle on tags to each mat. For Thanksgiving, I love the idea of using the placemat as an activity for kids (and adults) to do while waiting for dinner! 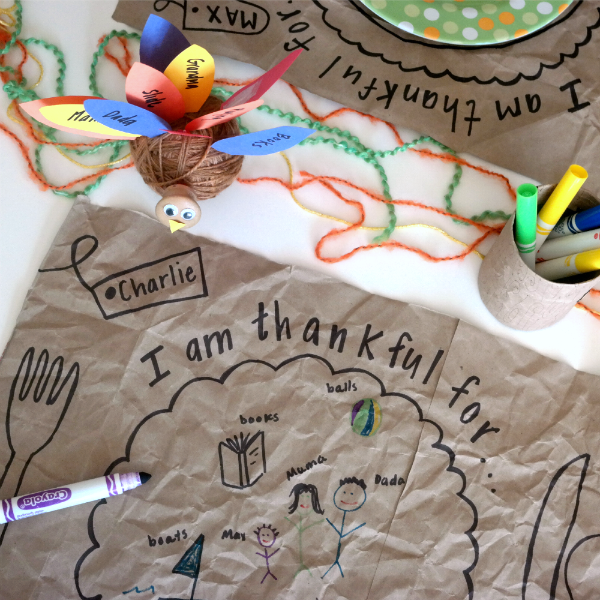 Oh and I’ve got an easy tutorial for the yarn wrapped thankful turkey craft too! And if you prefer video how to’s, I’ve got you covered! Thank you for sharing with us at Snickerdoodle Sunday! What a cute idea and I’m sure my kids would love making these! Thanks so much for sharing at Share The Wealth Sunday! This is an adorable item. Perfect craft to keep them busy while dinner is being prepared. Thanks for sharing on Sunday’s Best linkup. So fun! We’re having out of state guests over next week & I think I’m going to do this for dinner Wednesday night to kick off the holiday! Thanks for the idea!! This is a great idea, and I am definitely going to start this tradition with my boys starting this year! Thanks for sharing this with us at our Throwback Thursday link party! These look like so much fun! My kids would love doing something like this during Thanksgiving. Thanks for joining the Family Joy Link Party! Good idea to provide some table time entertainment for family meal celebrations like Thanksgiving. Thanks for sharing at Family Joy Blog Linkup. Yay for free!! and keepings the kids, and us older kids busy before the food gets done! !